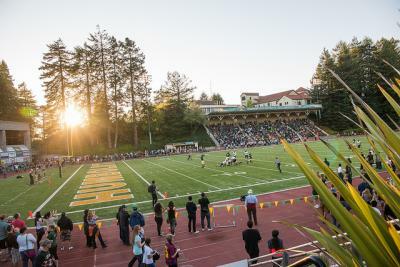 If you are an off campus entity looking to hold your event at Humboldt State University, please contact the Events Coordinator, Danielle Belleau, directly at 707-826-5788. If you are an on campus entity, please submit a Customer Service Request through our website. In your request, please provide: the name of your event, the date(s) of your event, the on campus location(s), and the time(s) your event will be held. Once your Customer Service Request is submited, please complete a Facilities Event Information Form and email to facilitymgmt@humboldt.edu. Facilities will send an email reminder to do so if a Customer Service Request has been received. If you have changes after submitting this form, these can be submitted via email to facilitymgmt@humboldt.edu. Completed Facilities Event Information Forms should be sent two weeks or more before the event date. HSU is comitted to zero waste, a strategy that takes a 'whole systems' approach to eliminate the volume and toxicity of waste going to the landfill. Zero waste encourages source reduction, materials re-use, composting and recycling. Most event organizers at HSU are now making their events zero waste! Download the Zero Waste Events Checklist for guidelines and to get your event Zero Waste Certified. Thank you for your commitment to HSU's Zero waste goal! All State Supported University groups are not typically charged for these Facilities Management services. Auxiliary Units and Off Campus entities will be charged for services provided.